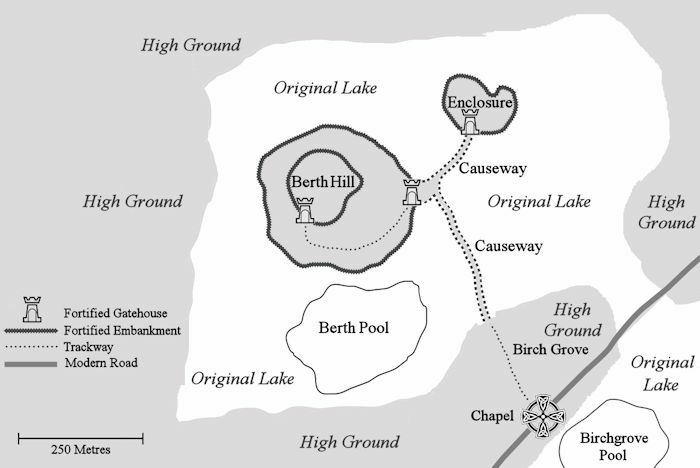 Map of The Berth, showing the ancient features and the outline of the original lake. The chapel stood on a promontory just to the south-east. There was almost certainly more than one chapel at Baschurch, otherwise the place would not have been called the Churches (plural) of Bassa in the seventh century. 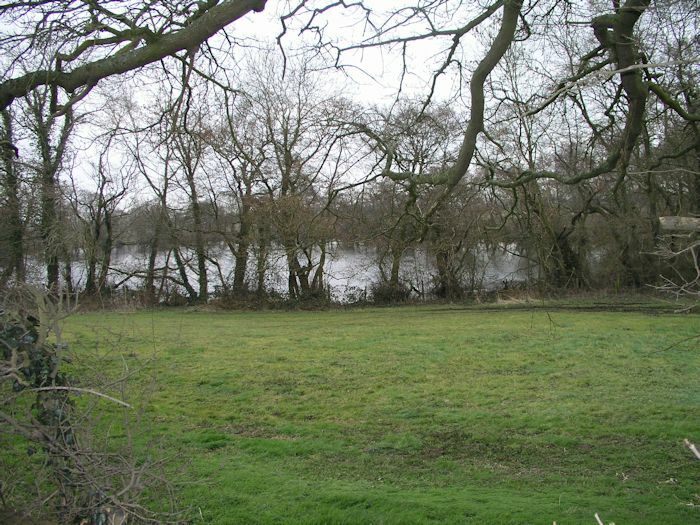 Medieval churches were often built on the sites of pre-existing Dark Age chapels, and records from the early twelfth century record three churches in the area, but only one was close to the shores of the original lake. Indeed, its foundation stones were still visible in the early twentieth century. It was beside a lane around 200 metres to the south-east of southern Berth causeway, but the stones were removed and the site tarmacked over when a modern road was laid in the 1930s. (There was no proper conservation legislation protecting such old ruins in England until the 1960s.) It stood on a spur of high ground known as the Birch Grove that jutted out into the original lake. In fact, the area is still called Birchgrove today, and part of the lake still survives right next to it as Birchgrove Pool. There was one final piece of evidence that was highly significant. Amongst the foundation stones that were taken away when the modern road was laid was a broken slab which appears to have come from the side of an interior tomb, rather than a grave. The limestone slab, around thirty centimetres wide, fifteen centimetres high, and four centimetres thick, has what appears to be part of a Latin inscription carved into it: the letters HIC. This was probably part of the words HIC IACET, meaning “HERE LIES”. It may or may not be from Arthur’s tomb, but it does show that the chapel did contain at least one tomb. It was taken to the British Museum for analysis where it was thought to be a panelling stone from the side of a “tomb chest” as it was too narrow to be a grave stone. A tomb chest was a memorial structure, usually around two metres long, one metre wide and one and a half metres high, placed over the entrance to an underground vault where bodies were interred. It was impossible to date, having not been found in situ, but its style was in keeping with tombs of the early sixth century when Arthur is said to have died. Post-Roman tomb of the early sixth century which covering an underground vault where the deceased was laid to rest. The stone slab probably came from the side of such a tomb. 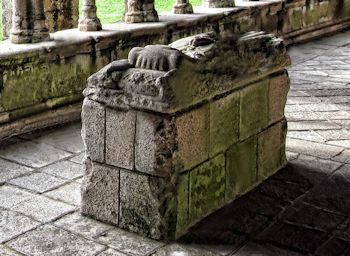 If Arthur was buried in a chapel tomb rather than an outside grave, then it would likely have been similar in design, rather than the unmarked circular pits of the later period when Cynddylan died. 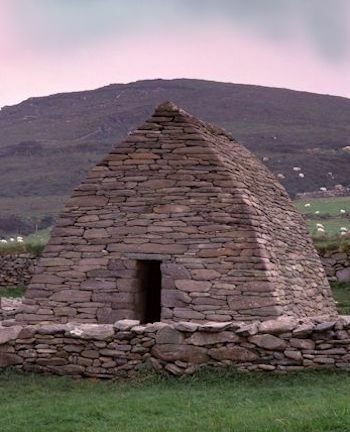 A rare example of a surviving Early Dark Age Christian chapel, similar to the original building that would have stood at a Birch Grove around the year 500. If the legend of his burial is based on truth, then such a simple holy shrine might have housed the tomb of the historical King Arthur. What made this location of further significance to Graham was its name. The knight who remained as a recluse at the chapel containing Arthur’s tomb was Bedivere. This name Bedivere, however, is in fact a late medieval rendering of the original Brythonic name Bedwyr, which is how it is written in all the earliest Arthurian tales. In these tales Bedwyr is a Celtic warrior, not a medieval knight. Still preserved in modern Welsh as bedw, the Brythonic word bedwyr means “birch”, as in the tree. It was not unusual for Celtic peoples to name their children after trees, and some are still preserved in Wales today, such as Rowan, Hazel, and Holly, and there’s Owain meaning Yew. Whether or not a warrior called Bedwyr actually fought alongside the historical King Arthur is an open question, but the tradition that he did existed right through the Dark Ages, and he can be found in the oldest Arthurian stories dating from the ninth century. The point is that right on the shores of the original lake surrounding The Berth there was a place called Birch Grove in English, which might originally have been Bedwyr’s Grove. Perhaps the story of Bedivere living as a hermit in the chapel gave rise to the name of the place, or maybe the place was named after an ancient tradition that Arthur was buried here. Either way, the Birchgrove chapel is the only church known to have stood on the shores of the original lake, and if The Berth is the original Avalon then it is the only site in the area that fits with the legendary burial place of King Arthur. 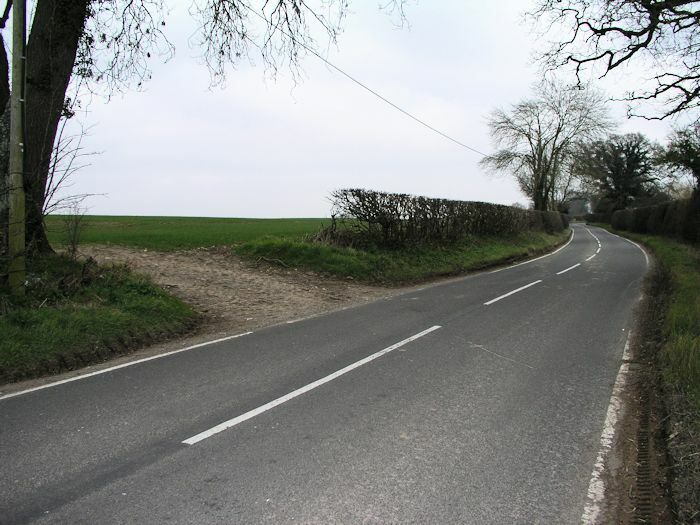 The road works in the 1930s, and all maintenance since, has only disturbed the surface of the site. Any tomb and its contents should still be undisturbed, deeper below the ground. Unfortunately, a geophysics survey has proved ineffectual, as the road surface and foundation rubble immediately beneath prevented any useful readings. However, unlike The Berth, the site of the chapel has not been listed as a protected monument, and it only needs the permission of the land owners for an excavation to take place. Graham is at present hoping to persuade the local authority responsible for the road to grant permission for a proper archaeological dig. As of this time, Graham is firmly convinced that under this quiet country lane in the Shropshire countryside there survives the historical King Arthur’s tomb. On what is now the modern B4397 road where it joins the old trackway from The Berth, there once stood an ancient chapel. Compelling evidence asembled by Graham suggests that here in Baschurch, beneath the tarmac, there still lies buried the tomb of the historical King Arthur. Birchgrove Pool, as seen from the site of the old chapel. This was once part of the original lake into which the sword of the historical King Arthur may have been thrown. The broken limestone slab found at the chapel ruins at Baschurch. 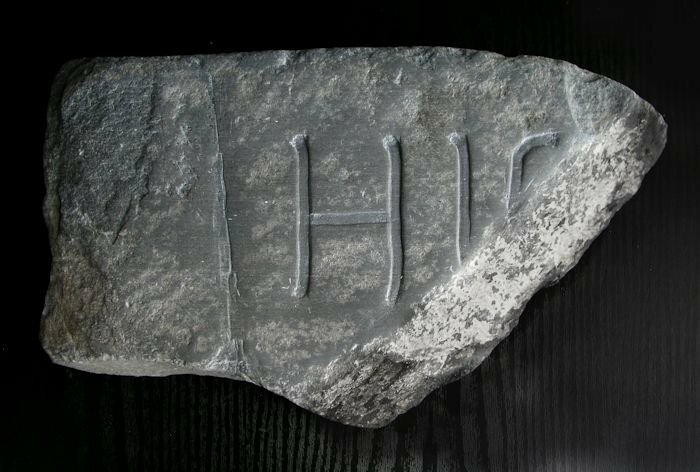 It is inscribed with what appears to be the letters HIC, possibly the first word of the Latin phrase HIC IACET – “HERE LIES”. The rest of the slab probably included the name of the deceased, plus an epitaph. Could this have been the stone from the tomb of King Arthur that, according to legend, bore the Latin inscription: HIC IACET ARTHURUS REX QUONDAM REX QUE FUTURES - HERE LIES KING ARTHUR, THE ONCE AND FUTURE KING?